So I got the plans for the new fence and rail system, got all the materials it called for. On Saturday morning I began the layout and initial cuts for the fence rail, once it was done, then I began to work on the fence itself, it was a,slow build on purpose with countless times checking square and making sure each piece was as close to perfect as possible. I did have to recut a,few pieces as I had cut them all to the same length but a few were supposed to be 2 1/4 in longer. Once all dried and set I again checked square on table, checked how it would slide in the table a nd rail. Then laquered it black, and use paste was where it will need to slide. All in all it turned out pretty well. Interesting, what plans are these? I am a bit confused as to which side we are looking at in the pic? are you have to reach all the way across the white are to start your cut? Or are you walking around to the back to set the fence? The fence rail is now attached to the melamine in feed, and then the fence slides on that rail. I need to adjust the elamine to sit flush with the table saw, but have not done it yet. I want to make a few more test cuts and see if the fence is going to work the way I want it. As of now it is much better then the fence that came with the saw, but I may still buy an aftermarket set up with rail and put that in. I got the plans from the link below, the cost was 10 dollars for the download. You have assembled it nicely. Hope that works out for you. From taking a glance, the website directions for the build look like they are as much or more useful than the plans the originator is selling. The whole setup is intriguing, though. When you are standing at the front of the saw about to make a cut, is that infeed table and fence rail putting you physically 20-inches +/- or so further back, behind the saw table surface? It’s personal, I know, but I could not work from that far away from the blade and miter gage. In fact I often lean over the blade to visually line up a cut mark with the correct edge of the blade. When I make a cut, I often have my left thigh leaning against the fence rail. I just went a checked and found that the distance from the back of the blade slot to the back of the fence rail is 15-1/2” on my setup. Perhaps the photos are throwing off my perspective about yours. I do just-have-to-ask, what fence did you use to make the square cuts needed to make a fence? I will have to measure the distance when I get home, to get the actual distance. 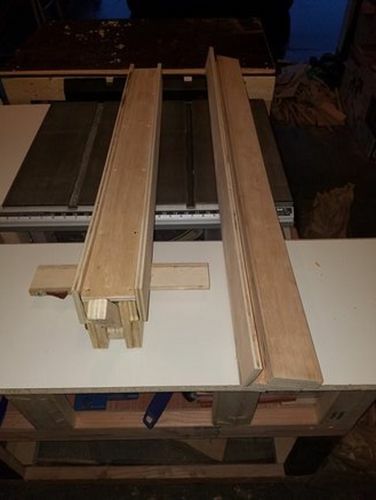 I know the contractor saw that i built into that cabinet does have a short in feed though, why I built the cabinet and extended the in feed. Have to work on putting in the miter slots yet too. The website article and the plans are supposed to work together put out by the same person. A long with the youtube video of the build for it. I do still lean over a bit to make sure I am on the line I want to be on before making the cut. Like you, but I then lean back once I know I have lined up the cut the way I want. As for what fence did I use, well I had to use the fence the saw came with originally, which requires me to take meausurements from the blade to the fence in about 3 areas, start, center and exit of the blade to make sure the fence is lining up and square to the blade, one reason I dont like it so much, if you just try and set it by one measurement the back end can be off as much as an 1/8 of an inch I have learned (the hard way). Like I said though if this fence doesnt work out much better then the original then I will have to spend the money on a aftermarket one and do that install. If it does work out the way I am hoping, then I will be moving the in feed up to cover that open gap I have to have now, for the old fence, which will shorten the in feed by about 3 to 4 inches, but still plenty of in feed for making safe cuts of longer pieces that I have to rip cut. Well I ran through a resaw test of 4/4 cherry taking it down to 3/4, which actual width I took off was less than an 1/8 of an inch. I used the new fence first and then used the old fence and the new fence required less measurements for accuracy, and got all pieces to 3/4 of an inch. Was about 10 pieces total between the two, looks like it is going to be a very good fence after all. 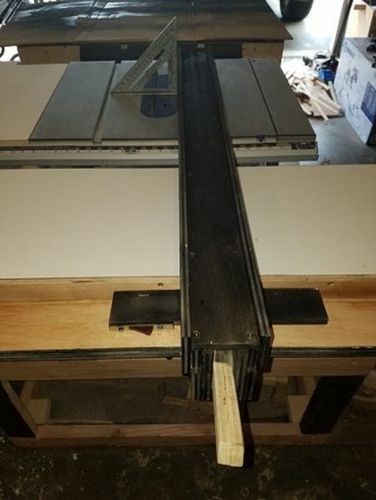 As for the length of my in feed, currently 23 inches total, but once I remove the old rail system and move the melamine forward to rest against the saw table will be less than 20 and I can always re cut the melamine if I want shorter. That sounds good, now you just need to rig up a remote power switch. Actually I am planning on moving the switch to just under the lip of the in feed, but a remote switch is a good idea too. Will have to check on that. Looks great! I built that fence as well. John’s plans are excellent and well thought out. The design allows for easy adjusting once installed to get everything square, unlike most of the homemade wooden fences I’ve seen on YouTube. Maybe you can build it without buying the plans, but he certain deserves the $10 for all the work he did into designing, writing the article and producing the videos. The plans are very detailed.